From the earliest days of Winchester Hospital, volunteers have played a pivotal role in our mission to deliver the highest quality health care services. In fact, Winchester Hospital was founded by volunteers – the local Visiting Nurse Association – in 1911. Today, about 800 volunteers each year devote their time and energy to supporting our patients and our staff with their community service to Winchester Hospital. We tell our volunteers that we couldn’t imagine being without them – and they tell us that they get just as much out of their volunteer experience as they put in. For nearly a century, individuals with the most unique and unusual backgrounds have come to Winchester Hospital to share their time and energy. Concern for others is the core of the program’s past and of its future. 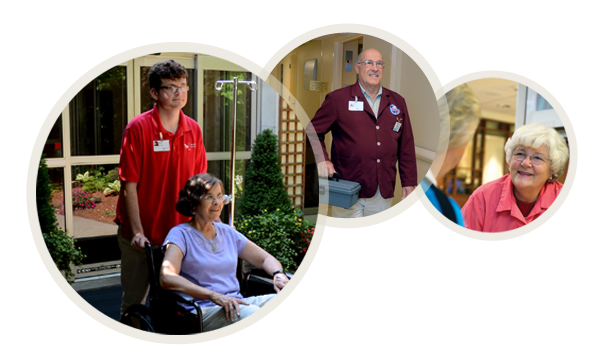 Today’s volunteer has many opportunities, because Winchester Hospital’s services are growing in many different communities. It is possible to be a volunteer in various locations, as long as you are committed to providing the best service that compliments your skills and interests. Anyone who is over age 14 is welcomed to inquire, either by phoning the Volunteer Office or by completing an application form. If you decide to become a volunteer at Winchester Hospital, you will be part of a team that plays a pivotal part in providing outstanding patient satisfaction. You will make a difference in just one three-hour shift per week. It’s the personal touch of volunteers that helps to make Winchester Hospital extraordinary in the eyes of all people it serves. We invite you to learn more about opportunities for adult volunteers, college student volunteers and junior volunteers. We also invite you to download and review our Volunteer Requirements. Volunteers must meet all requirements in order to become a volunteer at Winchester Hospital. For more information, the Volunteer Office welcomes your call: 781-756-2625. You also may email us at whvolunteers@winhosp.org.